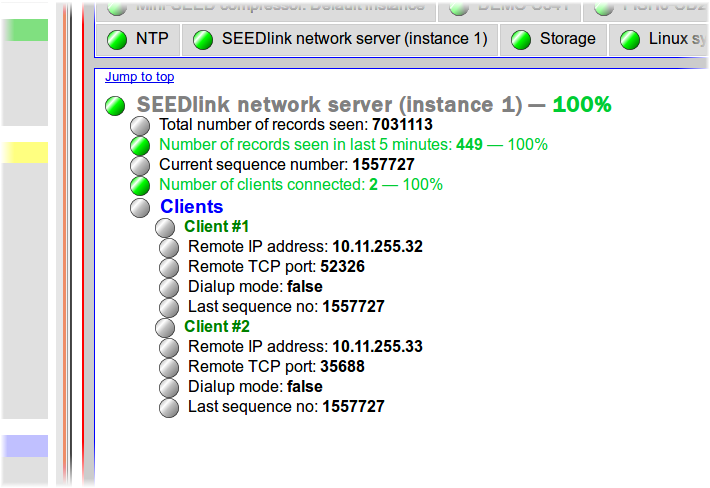 How do I configure my system to transmit mini-SEED data using SEEDlink? This document applies to systems running the Platinum operating system. This includes acquisition systems such as EAMs and NAMs, digitisers such as Affinity systems and DM24SxEAMs and digital instruments with embedded acquisition modules such as 3TDEs, 40TDEs and 5TDEs. The SEEDlink protocol requires that the data-consumer contacts the data-provider and requests data. This is known as a "pull" connection because the consumer initiates a connection down which it then pulls data. The data-provider does not "push" data to data-consumers unless they request it. In this document, we will refer to the data-provider as the server, transmitter or sender and to the data-consumer as the client or receiver. We first configure the mini-SEED compressor (gdi2miniseed), which packetises the data from the central multiplexor (gdi-base) and we then create a SEEDlink server instance (seedlink-out) with automatic channel naming. Lastly, we filter or map channel names, if required. Because SEEDlink can be used to talk to many different systems, we're going to use the IRIS slinktool as the test receiver in these examples. This is the reference implementation for the protocol so, if slinktool works but your system doesn't, the fault is probably with your system. Note: Although the default instance is marked as “does not start automatically”, it will be started if a service that requires it is started. We will configure a SEEDlink server later in this procedure: that will require the compressor, so we don't need to configure the compressor to start automatically. 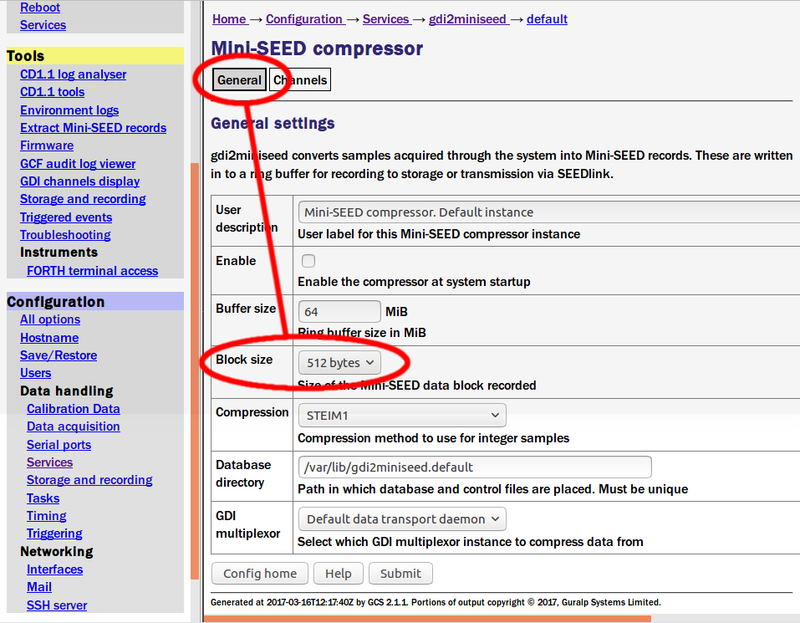 If you do not want to record data locally in mini-SEED format, click on Mini-SEED compressor. Default instance - does not start automatically. If you do want to record data locally in mini-SEED format and you are happy for your recorded data to have 512-Byte blocks, click on Mini-SEED compressor. Default instance - does not start automatically. On the General tab, check that the block-size is set to 512 Bytes. This is essential: SEEDlink does not work with other block-sizes. Scroll to the bottom of the page and click if you have made any changes. If you have no instances configured, click on Create new service instance; Otherwise, click on the instance that you have created. Make sure that the Enable check-box is ticked. The Server hostname/IP address field should be left blank. The Server port/service name should be set to seedlink unless you have a reason to specify a different listener port. Note: If you created a new compressor instance earlier (so that you could record with a different block size), you should select your new instance in the Mini-SEED converter drop-down menu. Scroll to the bottom of the page and click to save your changes. Click for the seedlink-out.0 service. Next, visit Home → Summary → System status. The tab for Mini-SEED Compressor. Default instance should have a green indicator ( ). It will have started automatically when you started the SEEDlink server. The tab for SEEDlink network server (instance 1) should have an amber indicator ( ) because it has no clients at the moment. The system will provide a default mapping between the GCF channel names and the mini-SEED channel names. This is normally adequate but, if you want to use different names for the mini-SEED channels, you can change the mapping. This is easy to do if you run the system in automatic name mapping mode for a few minutes; this allows the system to pre-populate the table with a list of the incoming channels. This is why we have left channel mapping until now. The system will display the list of configured compressors. Select the one that you configured earlier and click over to the Channels tab. Automatic - all channels are compressed and named automatically. This mode offers no filtering and provides system-generated names for each channel. Semi-automatic - all channels are compressed, names may be mapped below. In this mode, one or more of the channels may be renamed by editing entries in the mapping table. Manual - only channels named below are compressed. This mode offers both channel filtering and name mapping. Note: Clicking on any row will open a new row. In the same way, rows can be deleted by clicking the corresponding button. If the form is submitted when the table is full, extra blank lines are appended. When you have finished making changes, scroll to the bottom of the page and click to save your map. The testing described here uses slinktool, which is the reference implementation for a SEEDlink client. We have configured the SEEDlink transmitter to use the default SEEDlink TCP port (18000) so we do not need to specify that during the tests. If the name(s) of the station(s) is not what you expected, revisit the name mapping described above and ensure that you clicked to save any changes. The -p argument to slinktool prints header details of each packet received. You need to specify the IP address or the DNS name of your Platinum system in place of 10.10.0.2 below. Type + to stop the printing. If both of these tests are successful, the configuration of your transmitter is complete and you can start to configure your receiver. Note: If you want different clients to see different selections of streams or different mapped names, you will need to configure multiple server instances, each listening on a different port.